That’s right. 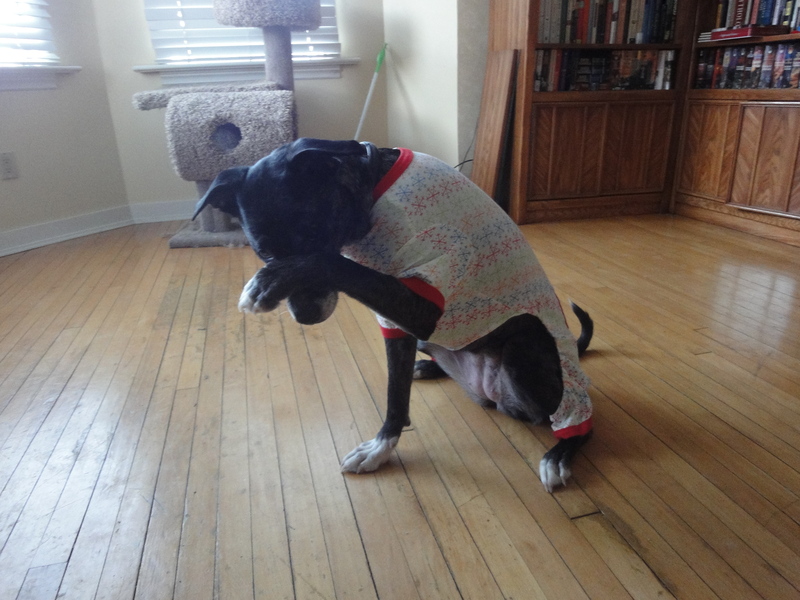 Shiva is the ashamed owner of her own pair of pyjamas. And not just any pyjamas, adorable, snowflake, black-flap pyjamas. May the PH’s of the world sigh in exasperation. It is all due to the thoughtfulness of my Haligonian friend, Kelly. She saw Shiva’s plight online and decided to take action. A quick thinker, is this woman. My itchy little puppy should be grateful to have someone so kind looking out for her. The only downer in the whole scenario isn’t that Shiva hates the clothing. Not even a little. Willing to do anything to please, Shiva doesn’t care about the additional fabric. No, the unfortunate thing is that the PJ’s do not, in fact, fulfil their intended purpose. Light and cut over the belly, they expose the very area we were seeking to protect. Not that this matters. The photos more than make up for any lack of armour. Even blurry she is just too, too dear. Poor dog. I would feel bad for her if she didn’t seem to enjoy them so much. Maybe clothing and dogs isn’t such a tacky combination as I’d thought. Don’t worry. I am not going to start dressing her in tutus or tiaras. Please, my dog has never been that kind of girl. But every once in a while, for the purpose of adorableness, maybe a doggy outfit or two isn’t beyond the pale. Then again, perhaps it is better to quit while we are ahead. 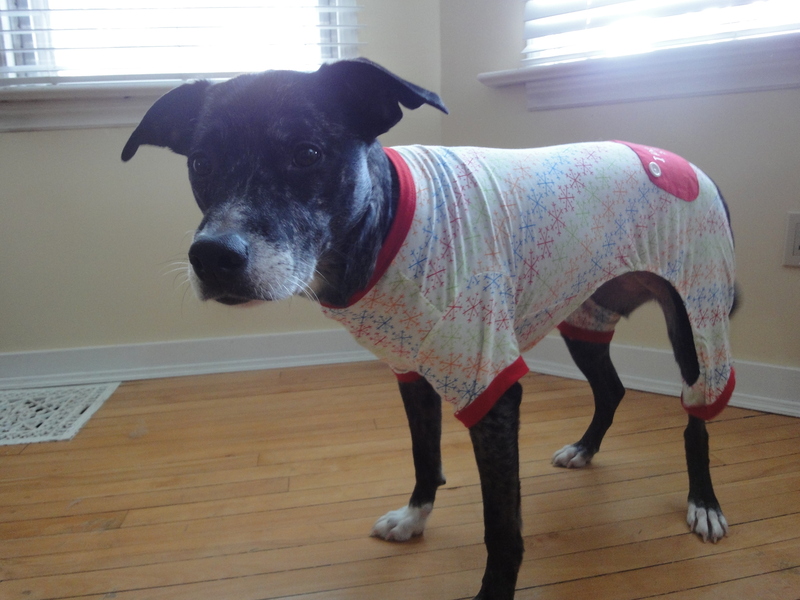 As a practical individual, a large part of me does rebel at the sight of my dog bedecked in unnecessary jammies. If only my buried impractical side could be reigned in. What do you think? ← Maybe Edmonton Isn’t Soooo Bad. Maybe. 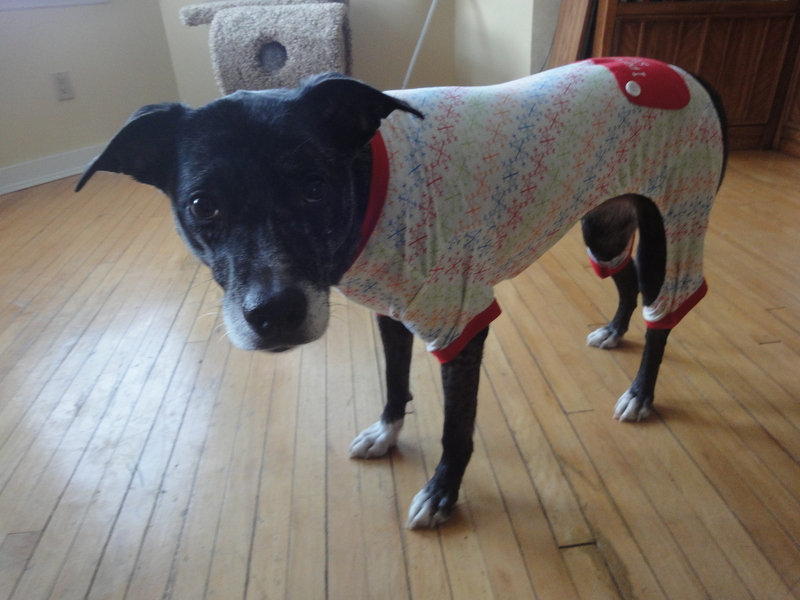 I just bought a pattern to sew Rio some fleece jammies… he has no idea what torture is in store for him (all in the name of being warm of course). These are great pictures!! AHHHH! I love it! Shivester, you are the CUTEST! I want Koly and Fe and Shiva to hang out together, in their jammies. *sigh* This is the best. Well Polly is jealous of those snazzy PJs. Shiva you wear them well. 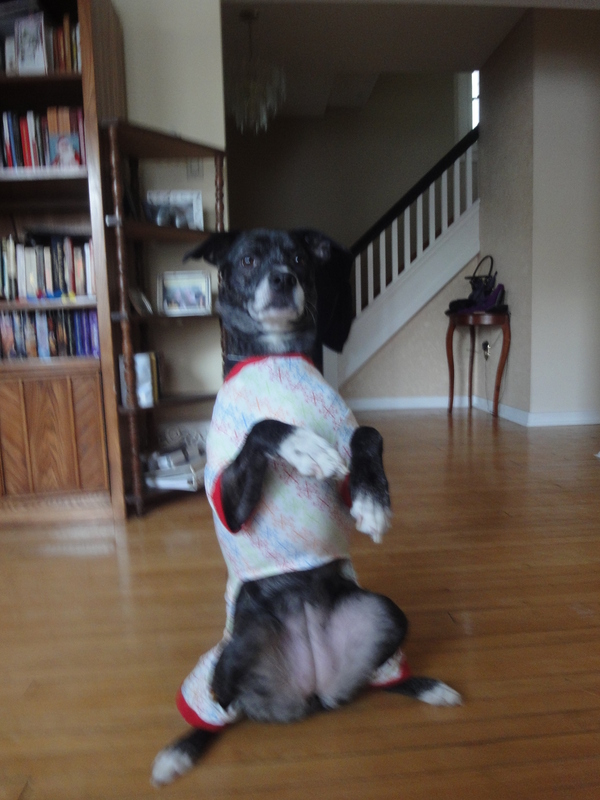 Polly either sleeps in a Kennel Coat or a dog fleece jumper, both of which expose the belly. She usually curls up and her belly is then covered. Ha ha it’s definitely a look – if Shiva seems to be enjoying wearing them I wouldn’t worry too much! But maybe don’t take her out in public – you wouldn’t want her new doggy friends to mock! I think she looks adorable. Too bad they don’t cover her tummy, but maybe she feels warmer in them. Shiva in pj’s just brought the biggest smile to my face and the fact that she doesn’t mind them a bit is even better! Sometimes I buy dog outfits just for the purpose of taking a picture! Otherwise, my dogs aren’t too excited about them. The jammies look adorable on Shiva! Holy moly!! Shiva is way too cute in her jammies! I’m totally heartbroken, actually…. They had those exact PJs at Target. In the whole stack there was one XL, which never happens, and I was thisclose to getting it for Lucas, then I second-guessed. Drat. Seeing how cute Shiva is, I should’ve done it. I don’t know if this will help, but when we had to cover Em’s belly, we put on a large t-shirt, then bunched the excess fabric in a knot on his back and secured it with a hair rubber band, which kept it taut. That’s not a good explanation… but, regardless, Shiva is darling! Just an FYI….. 🙂 I’m not sure exactly how big she is. She may be too big for this idea, but if you can get large baby onesies and just cut out the tail area so she can do her business, her tummy will be covered. Maggie’s idea would work, also. 🙂 She is adorable, although she doesn’t look like a tutu and tiara kind of girl. We only dress our one dog in clothes, and that’s because he will lick his skin raw. I hate doing it to him, but he’s used to it by now. 🙂 I hope her belly bets better, poor girl. Thanks for sharing! I’m not big on dressing the animals, and they don’t like it much. My hubby doesn’t like it at all. But just once I’d love to put our little beagle Cricket in pajamas….I just know she’d be so stinkin’ cute just like Shiva is! Hubby has let me put a sweater on the new puppy though, he came up from Alabama and he is really cold outside in the NH winter, so it’s allowed….for now. 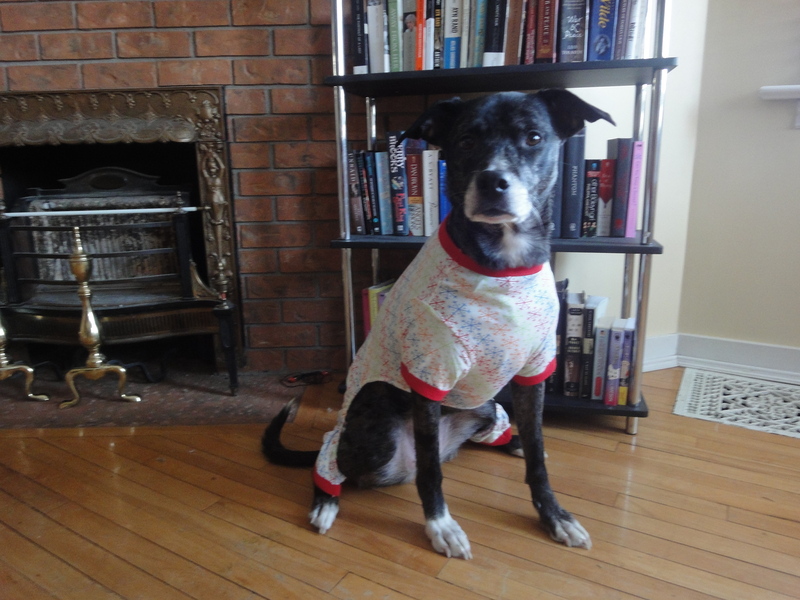 Hmm…puppy in pj’s might be pretty cute too! It’s all about the photographs… 🙂 Maybe our husbands should start their own support group. Well, it is her chest but it is so big that the PJ’s stretch a little and ride up. It’s all good. 🙂 Her scar has mostly healed now and she isn’t scratching at all any more. The aloe was a big help.